The following is a synopsis of how climate-related displacement and migration are treated in the Paris Agreement on climate change. What is the 'Paris Agreement'? On December 12, 2015, the 21st Conference of Parties (COP) to the United Nations Framework Convention on Climate Change (UNFCCC) concluded with the release of the Paris Agreement, a 32-page document spelling out a global plan of action for addressing the underlying causes of anthropogenic climate change and for developing strategies to plan for and respond to its impacts. Nations that are Parties to the UNFCCC must now ratify this Agreement according to their own national political processes and sign it before April 2017, at which time it will come into effect, assuming enough countries sign it. The full English text of the Agreement can be found here. Where do displacement and/or migration appear within the text of the Paris Agreement? What specifically does Article 50 mean? What actions are to be taken? The inclusion of Article 50 means the international community formally acknowledges that the future impacts of climate change may necessitate the abandonment and/or relocation of people and settlements in highly exposed locations. Article 50 directs that a task force be established to develop recommendations to the COP on how to avert or minimize future population displacements linked to the impacts of climate change, and to develop recommendations on how to address such displacement that does occur. Who will make up the task force? Responsibility for establishing the task force will be given to the Executive Committee of the Warsaw International Mechanism (see below). Membership will consist of the UNFCCC’s Adaptation Committee, its Least Developed Country (LDC) Expert Group, and outside organizations selected by the task force. Although these outside organizations are not specified, it is reasonable to expect that multilateral groups with strong interests in refugee affairs and international migration will be invited, such as the UN High Commissioner for Refugees and the International Organization for Migration. What is the Warsaw International Mechanism? What is the Adaptation Committee? What is the Least Developed Country Expert Group? In 2013 at COP19 in Warsaw, Poland, the COP established the Warsaw International Mechanism for Loss and Damage associated with Climate Change Impacts. Its purpose is to address loss and damage associated with impacts of climate change, including extreme events and slow onset events, in developing countries that are particularly vulnerable to the adverse effects of climate change. Following the COP16 meeting in Cancun, Mexico in 2010, the Adaptation Committee was established to provide technical support and guidance to the COP on adapting to climate change, to facilitate sharing of information and best practices, and to provide guidance on the financial and technological means and incentives needed to facilitate adaptation. Its membership includes representatives from developed and least developed countries, and small island developing states. LDC Expert Group was established in 2001, and provides technical support and advice to LDCs on the planning their adaptation strategies. “Least Developed Countries” refers to a specific group of states identified by the COP, a full list of which can be found here. What about climate-induced migration more generally? What does the Paris Agreement say about it? Not all climate-related migration is involuntary. The Paris Agreement does not use the term “migration” anywhere, it only makes reference to “displacement”. Similarly, the French language version uses only the term “déplacements”. The Agreement does not provide a specific definition for its use of the term “displacement”. The ordinary meaning of the term “displacement” according to the Oxford Dictionary is “The enforced departure of people from their homes, typically because of war, persecution, or natural disaster”. This implies that the Paris Agreement task force is being asked to consider only those situations where people are or may be obliged to migrate involuntarily for reasons associated with climate change. It would be up to the task force to decide whether facilitating voluntary, proactive migration in anticipation of the adverse impacts of climate change would be an approach that might avert or minimize the risk of involuntarily departures at a future date. Why is voluntary migration important? Countries that are highly vulnerable to the impacts of climate change, such as the small island state of Kiribati, have begun advocating for a “migration-with-dignity” approach to adapting to climate change. This means that involuntary relocation should be viewed as an option of last resort. Instead, opportunities should be created now that would enable voluntary labour migration of people from LDCs to developed nations, so they can develop employment skills, increase household incomes, and remit money home to facilitate development and investment. Should the day come when their home communities need to be abandoned, residents will then have greater resources and agency to shape their future, and will not be obliged to flee like refugees. For further information on the Kiribati description of migration-with-dignity, click here. Does the Paris Agreement mean that other countries will financially compensate people who are displaced because of climate change? No. Article 52 states explicitly the Agreement does not create any liability or basis for compensation. Is this the first time displacement or migration has appeared in official UNFCCC agreements? No. At the 2010 COP in Cancun, the COP signed the Cancun Adaptation Framework, which “invited” signatories to consider developing measures that would “enhance understanding, coordination and cooperation with regard to climate change induced displacement, migration and planned relocation, where appropriate, at the national, regional and international levels” (Article 14(f) of the Cancun Agreements). As the wording implies, there was no binding requirement that countries take such actions. 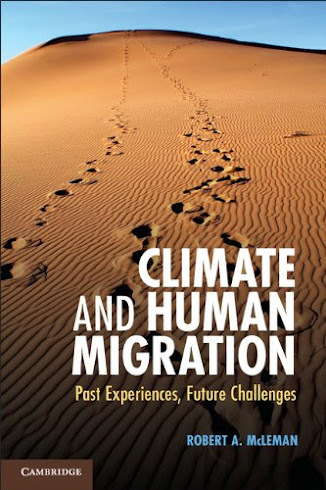 The main effect was to explicitly describe migration as a potential means of adapting to the impacts of climate change, and to encourage signatories, especially LDCs, to formally begin considering migration and displacement in the context of their wider adaptation planning. This synopsis prepared by Robert McLeman December 15, 2015. Comments are most welcome.